Stardock has said that they are working on a collector's edition for Rebellion, but have not given much details on it, except that it would be in boxed form direct from Stardock only, and that if they do decide to do it (they seem to be not sure as of yet) it will have something very big in it. I know that this is exactly the thing I have been waiting for from Rebellion, and I am more excited for the collector's edition than I am for any of the added game play features. I was really disappointed when Stardock said that they had canceled a retail boxed edition, but I would be devastated if they did not release the collector's edition. If they did release a collector's edition, I would be overjoyed and buy it as soon as possible. That would more than make up for the canceled retail edition, because I would always like a nice collector's edition more than a regular retail version. 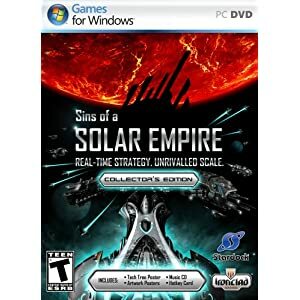 I cannot emphasize enough how important it is to me that Stardock send Sins of a Solar Empire out with a bang (in terms of boxed awesomeness), especially as after Rebellion the next Sins of a Solar Empire will likely be a number 2, and that won't be for a long while. That said, I have some recommendations for what to include to make this collector's edition fantastic. I was disappointed with the stuff in the regular Sins collector's edition, and saw no reason to buy it especially as I could get the sweetest part, the soundtrack CD, in the Game of the Year Edition. I don't see any need for a tech-tree poster this time (I personally think they are dumb). 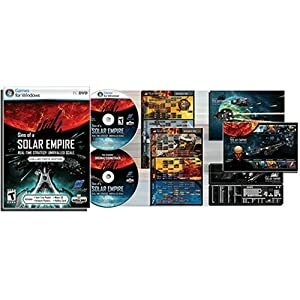 These are just some shots of the (in my opinion) mildly disappointing Sins of a Solar Empire Collector's edition. However, I feel that a new soundtrack CD is badly needed, as the additions made in the micro-expansions and now Rebellion will substantially increase the musical library of Sins. So much that it might take more than one CD to hold all of the game soundtrack. But this is exactly what I want in this collector's edition: I want the entire Sins of a Solar Empire soundtrack with all of its additions in CD form. I bought the Game of the Year edition for exactly this purpose, but now with the additions I feel it is that time when there should be a new soundtrack released. Because I do so enjoy the music of Sins of a Solar Empire. As far as that big thing goes, what I would very much like would be a model of one of the titans or capital ships on a display stand with a little placard telling the name of the ship and "Sins of a Solar Empire Rebellion" in an awesome font. What would make it even more awesome is of the ship was in its faction colors and insignia. And to top it all off, have a little hatch to open where batteries could be placed to make the ship light up. Other things that would make the collector's edition of Rebellion great would be a big, thick manual in color containing little pictures of the ships for each faction and a little back story behind them, a great, thick paperboard box with cool screen shots and a little summary of how awesome Sins Rebellion is. I always put my favorite game boxes up on display in my room and I always read through the manual of the game when I am installing it or when I get very bored. A small, hardcover art book containing concept art of the ships and some small interviews with the concept artists would also be very nice to include. I am very confident that Sins of a Solar Empire Rebellion will be awesome, but I fear that Stardock will cancel the collector's edition merely because it would be a lot of work and a lot of money. To that I say I will pay whatever it takes to purchase one of these, even if it is $100. It better have the coolness to back its price up. If anyone has any information about the collector's edition that I missed or has any ideas or things to say about it, feel free to post them here. Just listened to the Sins of a Solar Empire soundtrack on Youtube. As far as I know that is the only place to find the entire thing, in all of its glory. I really must complement Paul Schuegraf (that's the composer on my soundtrack CD) on his work. He is truly a master of music, to the same level as Jeremy Soule (The Elder Scrolls) and Howard Shore (Lord of the Rings), my other two favorites. I do so hope that Stardock will include the full soundtrack of Sins on CD. I know now after listening to the entire thing (many tracks of which I have never even heard while playing the game) that it would be more than one CD, at least two and maybe even three to contain the entire score. But it would be so worth it. I would pay to get a nice case made of paperboard containing all the CDs of the Sins soundtrack. Even if the entire soundtrack does not come with the collector's edition (which would make me very unhappy), I hope that Stardock will sell the entire soundtrack on CD maybe off of the website. I would definitely buy this. Even if they do not even make a soundtrack CD collection, Stardock better put the soundtrack up for download so that I can burn it onto CDs myself. This would still leave me slightly sad that I can't get a nice box or official logo thing on the CD, but I guess the important thing is the music and not the box. That's not to say, though, that I wouldn't prefer a nice boxed CD pack with the collector's edition or sold separately to a downloadable soundtrack. One example of a nice CD pack is the Elder Scrolls V Skyrim CD soundtrack sold on Directsong.com. It has the nice box, nice art on the CDs, great music, and even comes signed by the composer Jeremy Soule. This is not a great picture, but shows the nice box and CDs. Another example would be the Lord of the Rings: The Complete Recordings score that can be found on Amazon.com with one for each of the movies. This has an even nicer box and comes with a DVD recording of the soundtrack in much higher quality. It even comes with a small booklet detailing the making of the music and the different themes and instruments used. Here is a picture of its awesomeness. I own both of the soundtrack collections, and would very much like to see a nice Sins of a Solar Empire soundtrack join them next to my CD player. This is exactly the kind of thing I would like to see in the Rebellion Collector's Edition. Meh, I think collector's edition are for people who are buying into Apple's theory that you aren't awesome if you don't have an iPhone, iPad, iPods, and Macs. Although I got to admit I am one of those people. So why not, but I don't think it should ever cost that much. I have been playing computer games for many years and I truly miss when it was standard to get a big box with lots of stuff like for example a manual the size of a phone book. A collectors edition would be a instant buy from me. phone book manual would be AWESOME. why would you want stardock to write a manual the size of a phonebook, to explain why they can't fix minidumps? paper manuals are so stupid because the game is updated and things are made null and void. stop living in the past, i am not even an environmentalist, but a huge manual is a waste when you have a forums full of people who can answer your question, or just a general google search. I hope that if they do the "something big" is a model capital ship/titan! Actually I hope they just do a collectors edition. Even if the game is updated a lot a game usually do not change very much from release to end patch. It would be nice to have on the shelf and look at. Big nice and thought out manuals are great to read if you're in a situation where you can't play the game. If I can't get online I can pick up the manual if I need information about the game. The weight of a really massive manual when you hold it! I swear there's something magical about that feeling. Great for bludgeoning partygoers that just wont go home. It adds tons of atmosphere to the game if you can read a "book" with descriptions about all kinds of things in the game universe. Yes there have to be pictures too. Yeah. What Ravagus said. Except for the part about bludgeoning partygoers with it. I can think of a lot better things to hit partygoers with than a manual. If you don't want to injure them badly or permanently, then a hardcover textbook would be much more effective than a paperback manual that is probably less than 100 pages. If you do want to hurt the partygoers (maybe they are still at your house at 4:00 in the morning) you should use a wooden chair or a glass bottle. Plus, when these things shatter it will send a clear message to the uninjured party guests to clear out. Other than that, I think that a good manual with little pictures and back story of the ships and races is essential to a boxed edition, and with a collector's edition it better not be missing. Same thing goes for the CD soundtrack. Congratulations, Stardock, on making a great game and I do so hope that the collector's edition will live up to its awesomeness. Paul Schuegraf is a musical genius. Just wanted to re-iterate that since there do not seem to be many people who think that his music is great on these forums. Actually the only place I see anybody feeling the same way I do is on Youtube on the comments of the Sins soundtrack videos. If there is one thing the Sins of a Solar Empire needs, it is Paul Schuegraf. He should be the composer for all Sins of a Solar Empire games, as he has done such a fantastic job on the first game. Number two and its expansions and number three and onward if Sins is still going by then (I sure hope it will be). If there is any way to get his music on a CD to play in my CD player, I will do it. I will buy the collector's edition if it has the Sins soundtrack in it. I would buy it separately. If I had to download it and put it on a CD myself I guess I would do that, but a bit reluctantly because I love having the official thing. The collector's edition is the thing I care most about in Sins Rebellion, and the item I would most like in my Collector's Edition would be a little pack with the soundtrack on two or three CDs or however many it takes to contain the awesomeness. Music files are pretty easily to listen too from the Sound folder. Just need a media player like Winamp that can play .ogg files, and its pretty easy to convert to .mp3 or .wav to burn to a CD. Otherwise I think the Game of the Year edition of original Sins had a soundtrack. I wonder, whether all those small icons representing technologies on the techtree are originally hand-drawn full-size sketches, only to be scaled down for the need of the techtree . If this was true, i would not mind such sketchbook with all these pictures to be part of the collectors edition. I agree with Wunderbar. I am waiting for that button to show up because I will push it. I guess I was wrong about nobody caring about the tech tree posters. I wouldn't mind if one was thrown in, but I still would like a Rebellion poster with the Ragnarok titan more. I also think that the statue or figurine should be of high-quality materials.I would rather have a small, pewter model of a spaceship painted in faction colors than a giant spaceship made of plastic. This was the main reason that I did not buy the Skyrim Collector's Edition, even though that is my favorite game ever. The Alduin dragon statue was made not of metal or pewter but of PVC plastic. I could not believe Bethesda was trying to pull that on me and bought the regular edition. I hope that this will not be the case with Sins of a Solar Empire Rebellion. Thanks for the advice, GeoFan77. I already have the Game of the Year Edition, though, and was sorely disappointed that it did not have the entire Sins soundtrack on the CD. It didn't even have all of the original game's music. Even so, I have listened to it probably hundreds of times now and love it dearly. I feel that it is time again to make a new CD pack with the FULL soundtrack from Sins and its expansions, including Rebellion, in a CD pack either in the Collector's Edition or sold separately. But do you mean that Sins Rebellion would already have the full soundtrack in a folder? How would I get to such a folder? The problem is finding the music clips since all sounds are located in this file - all of them. Thankfully, the music pieces are named differently than sound effect files. Chances are that "Mine_Tech_OnSelected" is not a piece of music, but "Quiet 1, Quiet 2... Quiet 12" are all musical pieces. It is now just a matter of finding the music files, copying them, and pasting them into your "album" file. The new faction specific musical pieces are as follows. Wow, thank you for the quick response Yottsu. Will this be the same for Sins Trinity? I haven't pre-ordered Rebellion because I am waiting for the boxed collector's edition to be announced. Furthermore, will the files of the music all be named with numbers like Battle 7 or Upbeat 2 like on Youtube or will they have names like Watching the Borders and A New Call like in your post? Or will they be a mix between them both? Thank you for the help, but I still really hope that Stardock will put the entire thing on some CDs with the collector's edition. I will make do with this, though, if I have to put them on a CD myself. So, I just have to go into this folder and pick out all the music files and put them into an album and then I can burn them onto a CD. I will try this when I am at a computer with Sins Trinity on it (I'm not at one now because at my dad's house I cannot use the computer to play games like Sins, only to post on its forums). I am really excited for the new music in Rebellion, as I feel the music is Sins of a Solar Empire's most defining feature. That is only my opinion, of course, and I also very much enjoy the battles and the beautiful graphics and other aspects of the game. Since I have not pre-ordered the game, is there any way I could listen to the new music? Depends where you got Trinity. For steam I imagine its pretty much the same. Otherwise, in the same folder as your Sins .exe files, there is a folder called sound that will contain the music files. They are called things like Battle X, I don't know where the formal names come from. Anything that doesn't have underscores and is longer than a few KB is probably music. The music from Trinity is also in Rebellion. Please note that the files are .ogg files. For me at least, I had to download Audacity to be able to listen to them, but at least I now can save these .ogg files as .wav or something else that fits my fancy. I have not gone out of my way looking on something like youtube to listen to the new music, so I am not sure if there is a way to listen to it other than having the game yourself. Short and sweet - why did I not think of writing this? To expand on that, anything lower than 256KB will likely be a sound effect, while something that is over/around 1 MB is bound to be music. The music from Trinity is also in Rebellion. Please note that the files are .oog files. For me at least, I had to download Audacity to be able to listen to them, but at least I now can save these .oog files as .wav or something else that fits my fancy. Most good mediaplayers (IMO ) can play .ogg files natively (winamp, foobar). If you're still using Windows Media Player or itunes or something you'll at least need a plug in or something. If you're planning to burn them to a CD to use on non-computers Ibnpatuta, Yottsu is right that you'll probably want to convert them first. Audacity can do the trick but that's a lot of files to do one at a time. I use Foobar 2000 for mass conversions, just put all the music files into a seperate folder and you can convert them all to .wav (for max quality, if you can't fit them onto one CD then most CD players will take .mp3 as well). Yottsu and GeoFan77, you guys are awesome. Thanks for the great advice. So basically I just go into the folder, pick out the music files (that will be evidenced by their larger size and lack of underscores), copy and paste them into a file converter, convert them into .wav format (I definitely want highest quality even though my CD player is not very fancy), and then burn them onto a CD or multiple CDs if needed. Got it. I thank you (Yottsu and GeoFan77) again for all the help in case the collector's edition does not come with the entire Sins of a Solar Empire soundtrack on CDs. This is still the way I would prefer it, in an official form with the cover art on the top of the CDs and a nice case to carry and protect them and to display my love for Sins music next to my CD player. I think that it would go nicely with my Skyrim, Game of Thrones, and Lord of the Rings soundtracks. I guess I will just have to wait for the game to come out to be able to hear the new music. That shouldn't be long, though, if they are really releasing it in two months or less. I personally doubt that it will even release by early summer, as they are still balancing and de-bugging the TEC and the Advent and Vasari have not even been added to the beta, the Vasari not even finished. Still, I wish Stardock the best of luck in reaching their release goal. I would love to have the game by then because I would be at my mother's house where the gaming computers are so I could play it. I will need the entire summer to experience the game in its full awesomeness. I have the original DVD, with the two DVD's and a tech poster. They should make a Rebellion collector's edition. I think that a collector's edition should include trinity. Or maybe not. its just that if I were to get soase collector's edition, Would the extra stuff be accessible only through the game disc, or would it be on a seperate disc? When I installed trinity on my pc, it required me to delete my original SINS game. It was not a problem of course; trinity includes Sins. But will the collecters edition require me to delete trinity? I want to access the extra content, but if it requires me to delete trinity, and the content is on the disc with the game, then I won't buy it ( much as I would want to). Doesn't Rebellion already come with Trinity included? I remember this being mentioned a few times. When I installed Trinity on my computer, it did not ask me to un-install the original Sins, but this would not be a problem in Rebellion since it is already the full package and so you would not need Trinity anymore. I'm not sure what you mean by "extra content". Do you mean the additions made to Sins in Rebellion or something extra in the game that might only be in the collector's edition?